Showing results for tags 'shadows over hammerhal'. Hi all! GM:ing my first session of SoH tomorrow… After reading through some of the comments its seems that there can be an issue with players returning to town as soon as somebody gets grievously injured. I might have a sort of narrative solution for this but I need the some guidance from the TGA community. The plan is to keep tabs on how many times the players return to town. By the end of the campaign, and/or even half way through (if that would work), check the numbers with a post-game chart that tells what parts of the city that were destroyed. I might even add in some places and tie those places in with personal backstories – like a dwarven family for the Cogsmith or the Fleetmasters lover and/or frigate. This is to make them care. We are all old RPG nerds but at times the power gamer pops out, so I want to have a "built in" incentive. The questions I ask to all the people whom have played through the Shadows over Hammerhal campaign is: How many returns to town per dungeon level would you recommend to keep the players challenged, but not discouraged? Also, how many returns to town in total would you say is fair? The questions are in regard to the gameplay, not the story-line. 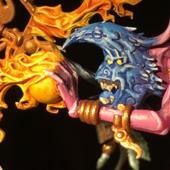 I am starting a brand new thread for my Warhammer Quest related stuff. 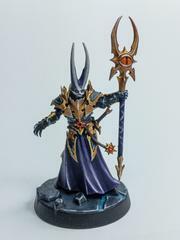 I have both Silver Tower and Hammerhal, and a few extras as well. I hope to get them all painted up over the course of this school year. I decided to start with the Brimstone Horrors.